Aerodynamically contoured, impact-resistant polycarbonate fairing side visors with chrome-plated, corrosion-resistant zinc mounting clamps add greater wind protection. Color-matched, impact-resistant injection-molded ABS plastic construction incorporates a brake light and is designed to integrate with the Gold Wing's aerodynamic shape and style. Aerodynamically integrated, color-matched, impact-resistant injection-molded ABS plastic construction complements the rear spoiler with brake light for function and style. Designed to accent the lower saddlebags, these color-matched, impact-resistant injection-molded ABS plastic spoilers are aerodynamic and integrate with the Gold Wing's styling and shape. Chrome-plated finish, injection-molded ABS plastic lower cowl adds style and function. Chrome-plated finish, injection-molded impact-resistant ABS plastic windshield garnish adds style and function. Abrasion-resistant 1680-denier ballistic nylon construction with leather trim. Embroidered Gold Wing icon and logo, external buttoned pocket, provides maximum saddlebag and trunk volume utilization (approximately 150-liter total capacity). Abrasion-resistant nylon construction with silkscreened Gold Wing icon and logo. Provides maximum saddlebag and trunk utilization (approx. 150 liter total capacity). Elastic support net firmly holds cargo in place at four points; easy installation. Chrome-finished, injection-molded ABS plastic accents the area above the passenger floorboard with style. Contoured design offers Honda quality fit and corrosion-resistant, double-nickel-chrome-plated steel construction. Corrosion-resistant tubular steel rail accents the perimeter of the trunk with double-nickel-chrome-plated styling. Corrosion-resistant tubular steel rail accents saddlebag perimeter with double-nickel-chrome-plated styling. Corrosion-resistant, double-nickel-chrome-plated tubular steel contours to stylishly accent factory front fender. 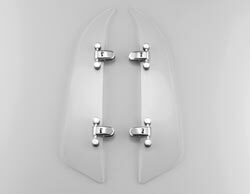 Chrome-plated steel fairing accents install in minutes and mount directly to the existing fairing body. Set of two (right and left sides). 30-watt maximum output waterproof speakers integrate with the standard audio system to offer premium sound quality. 14-oz. premium quality carpet material with patch-type Gold Wing icon and logo on trunk and saddlebag mats. Mats are custom-shaped for the new Gold Wing and also feature serged edge binding and a slip-resistant polypropylene backing. 13-oz. bulk continuous fiber carpet with embroidered Gold Wing icon and logo on trunk mat and Gold Wing logo on the saddlebag mats. Mats are custom-shaped for the new Gold Wing and also feature serged edge binding and a slip-resistant polypropylene backing. Constructed of weather-resistant synthetic material and silkscreened with the Gold Wing icon and logo, this cover protects the seat from wet weather and the sun's damaging UV rays. Constructed of weather-resistant synthetic material, this cycle cover features a moisture-venting system as well as a soft inner liner to prevent windshield scratching. Contoured to fit the Gold Wing. Constructed of high-grade vinyl material with soft inner liner and embroidered with the Gold Wing icon and logo. Original factory fit, injection-molded, chrome-plated finish ABS plastic accents the saddlebags with style. Injection-molded, chrome-plated finish ABS plastic accents add style to your trunk with original factory fit and finish. High-quality, chrome-plated steel design integrates with Honda-engineered exhaust system. Three-bolt mounting offers ease of installation. Injection-molded, carbon-fiber-type finish, ABS plastic accents trunk with a high-tech look and original factory-quality fit. Injection-molded, carbon-fiber-type finish, ABS plastic accents saddlebags with a high-tech look and original factory-quality fit. Unique two-tone 1 gold plated cylinder head cover emblems with new Gold Wing icon in gold and black Honda lettering. At 53.5mm (2.08 inches) taller than the standard windshield, this polycarbonate windshield offers additional wind protection while maintaining Honda's original factory quality standards. Polycarbonate windshield side visors with Honda branded hardware (for standard windshields only). 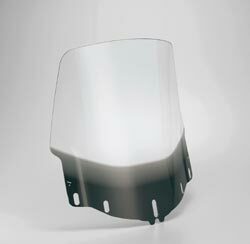 At 100mm (3.93 inches) shorter than the standard windshield, this polycarbonate windshield offers a sporty look and Honda's original factory quality standards. Polycarbonate windshield side visors with Honda branded hardware (for tall windshields only). 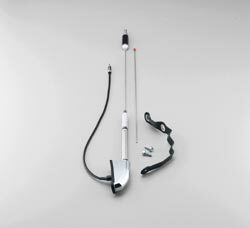 This CB antenna kit is specifically designed to be compatible with the Honda CB radio system and provides superior CB channel reception (use with CB radio kit). 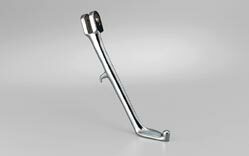 Chrome-plated tubular steel construction is contoured to fit the trunk profile. Weight limit is 2 pounds (0.9kg). Note: Trunk rack will not mount with rear spoiler installed.